Tim Kasher has been at the center of the Omaha/Saddle Creek universe since the early 90's. As the years have passed by Kasher has risen to the forefront of the indie rock world fronting highly-touted musical acts Cursive and The Good Life. Despite all his success, Kasher has remained a grounded individual, never letting success go to his head. 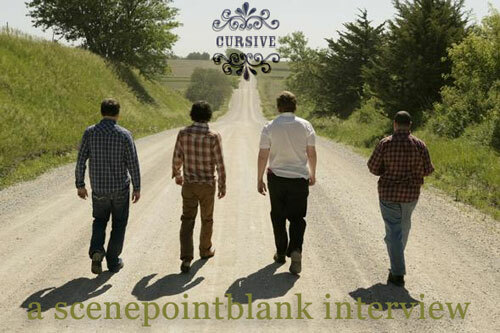 Scene Point Blank recently spoke with Kasher about all things Cursive, The Good Life, and other worldly topics. Scene Point Blank: The tour Cursive is just finishing up now with Against Me! and Mastodon seems like an odd combination of bands. I was wondering how this line up came about? Tim Kasher: It's probably a better question for Mastodon, because I think they're the ones who kind of spearheaded it. The impression I have is they were doing a lot of heavy metal tours, but they have a great fan base of people who aren't necessarily metal heads or go to metal shows, so they wanted to, my impression anyways because I can't speak for them, play to those crowds. If they headed out with bands like Cursive, and Against Me!, maybe other groups would come out. Scene Point Blank: Coming in from a headlining tour and playing in front of obsessive Cursive fans such as myself, to this tour where you're in front of people who might be there for the other two bands, how does the crowd reaction differentiate? Tim Kasher: It's been great, actually. We still see ourselves very much as a support act, they've been really generous by calling it a tripe co-headlining tour. I still kind of worry every night that we go on stage that people will boo and hate us for not being metal or something... but it hasn't happened yet. It really has been a lot of generosity as far as the fans go, and hasn't been that, well, scary. Scene Point Blank: I know you have the last couple of dates for this lineup, and then Help Wanted Nights, the new The Good Life album, is coming out on September 11th. Where does that put Cursive? Will there be another hiatus? Tim Kasher: No, I think we're going to try and write a record through the summer and the fall. The Good Life really isn't going to do that much touring, so we're really going to try and get this done to see another Cursive record for next year, I guess. Scene Point Blank: Thematically Happy Hollow focused much more on a story telling element as opposed to some of the more interpersonal things you've done in the past. Can the same be said for The Good Life record? Tim Kasher: The Good Life record is actually intended to be a soundtrack to a screenplay, or actually a stage play, that I haven't had the chance to get made yet. I think it still works independently as an album, too. So we're putting that out and I'm still hoping to try and get the screenplay made, and they'll probably share the same title. As a result the album doesn't come off to me, and I don't think to anyone, as cohesive as things I've released previously have been. I wanted it to feel like a counterpart to the story that's going on, so they aren't actually stories themselves. Scene Point Blank: I know the Mogis brothers are producing again on Help Wanted Nights. Coming into Happy Hollow, from hearing the demos to hearing how it actually came out, there was a very big sound that was brought to the record, and then with Mike Mogis' work on Bright Eyes' Casadaga it's a similar grandiose type thing. Can we expect the new album to be in a similar vein? Tim Kasher: Nope, I am also very aware that that is how those albums turned out, so we sort of did a one-eighty, and I wanted to put out a record like we did in the last century, or stuff like we did in two thousand. When Cursive did Domestica, it was essentially the band, we recorded the tapes, and, I don't really remember, but I think it was done in like less then two weeks or something. Happy Hollow we spent about three months in the studio and that just definitely felt way too long. You talk to other bands and they'll spend a year on a record, you know, but I don't really like the idea of taking three months. Everyone has different attitudes, but I kind of miss those simpler records that we all grew up on, so we definitely took that approach; recorded everything to tape, and spent more time in the practice space trying to make sure that the songs were finished. It's not going to sound very much like an over overproduced... I shouldn't call any of the stuff overproduced, but we tried to under-produce it. Scene Point Blank: A lot of the criticism of Happy Hollow, if you can really call it a criticism, is that it wasn't another record about booze and break ups. Do you ever feel pigeon holed into the persona put across on your early records? Tim Kasher: I guess if down the road that continues to happen, if people aren't interested in anything but that... I don't mind if Happy Hollow isn't everyone's favourite record. But if people are only going to embrace one form of writing that I do, then I will feel pigeon holed. 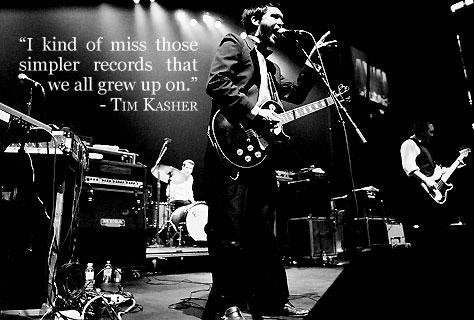 Scene Point Blank: Being as you've been in bands for such a long time, and some people more or less have grown up on your music from Slowdown Virginia to now, there comes certain fans who will see the person Tim Kasher as this rock star figure, or persona if you will. Is that ever intimidating to have so many stigmas associated with you? Scene Point Blank: Perhaps rock star is the wrong word, maybe more of a literary character? Tim Kasher: I think if people have an idea of a character that's fine, it's not really harmful to anything, but I don't think it has very much with me to do as a person. Scene Point Blank: Happy Hollow obviously has some cultural and political aspects to it, having some heavy criticism of what many consider to be the root of America. Is this sort of close-mindedness the biggest problem in America currently or what would you find to be the biggest fault? Tim Kasher: I think what really bothers me, or what I find really tiring, is when seeing the Democratic races begin that we're still using the same propaganda we always have. Even Democrats don't recognize it. There was a piece in The New York Times talking about how Barack Obama was the president of his class, or something, and that isn't news at all that's just The New York Times taking their liberal slant, but that's not necessarily American, I think that's just politics in general. In these next two years I think everyone should continue to question. If you're too left, that's the same problem as the people who are too right... even though that's the problem we've had for the last eight years. I'm curious to see who the Republicans will support, not that I'd ever dream of voting Republican. Scene Point Blank: You'd mentioned Barack, who seems to be a hot topic as of late. What are your feelings toward him and Hilary as the front-runners for the Democrats? Tim Kasher: It feels too hyped right now. Despite Obama being black, and there being a lot of excitement about that, it's just a skin color. It gets back into the whole wanting to pick a global president, or how tall a president is, and things like that. There is all this stuff that just shouldn't matter. It does seem, though, that he's risen to where he is because he's a good speaker and seems really intelligent. I just hope it gets closer to the point where people start judging not based on Obama being black, and Hilary being a woman, and start thinking about who they want as president based on what they have to say, you know, what they plan on doing. Scene Point Blank: Are you aware you are a video game character? Tim Kasher: If you're talking about Emo Game? (Sigh) yeah I know. Scene Point Blank: Your thoughts on that? Tim Kasher: Oh, I don't know. It's not a very advanced video game. (laughs) I think it's just coincidental that who ever that person is, happens to be a fan. They used some of our music and what not in there. I think it just sort of plays into the thing you were talking about earlier with the impression people have of Conor and I being these drunks, but I mean I don't really care. It's just a video game. Scene Point Blank: Why do you create art and what does that do for you? Tim Kasher: I guess when I think about things like that my thoughts have been focused on resonation. That's what I do, and I don't know if that's something that I've always thought about when writing music but, that's what defines art in a lot of ways. Whatever medium it is it's just something that resonates with you. That's the same approach that I have with music. You can go back to Happy Hollow even, where I did so many rewrites of those lyrics because I knew there would be a problem of doing something specific. It's so much easier to make lyrics when they were really personalized, so when they're not it becomes kind of tricky. I kept on doing versions and versions because I was afraid people wouldn't connect with them, so I finally got it to a place where I feel comfortable. Really with where that record is you have to be passionate about religion too. I got a lot of criticisms about that even when I was working on the record, because if you run into people who don't care about religion then it doesn't matter. I was working with people who were like, ?Why are you signing about this, I don't care about this...? and I was like, ?Well you should.? ( Laughs) I personally do care about religion so that does resonate with me quite a bit. Maybe it's a smaller group of people who care, but at least I did something important to me and different. Tim Kasher: I'm glad you got a new tape recorder. Posted Jan. 12, 2017, 6:24 p.m.
Posted Oct. 21, 2013, 6:27 p.m.
Posted Aug. 9, 2013, 10:43 a.m.